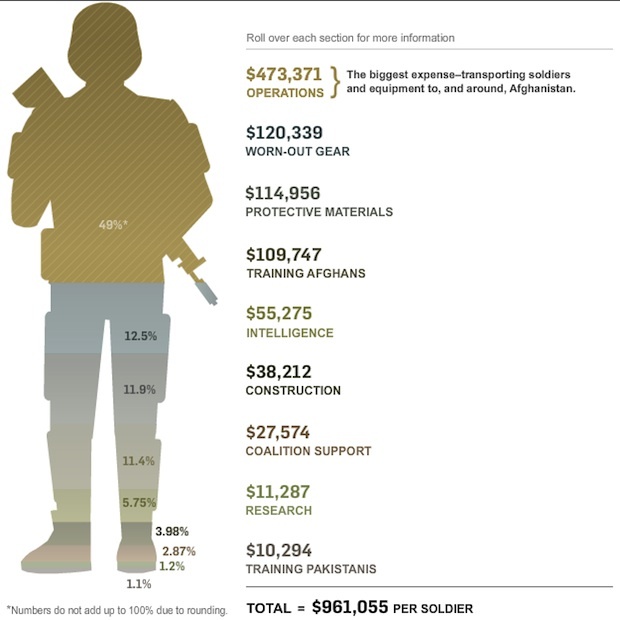 Infographic of the Day: Where’s the Money Going in Afghanistan? War is incredibly expensive–but when you hear figures ranging from $1 to 3 trillion, it’s easy for the eyes to glaze over. What helps put it in perspective is how much it costs to deploy every single solider. For example, when you average the $65 billion cost to deploy 68,000 troops to Afghanistan in 2010, that comes to about $1 million a soldier. Be sure to check out the actual graphic, which has details of the costs when you mouse-over each section.